I thought it would be a chance to try to understand what it means to be homeless at my age. 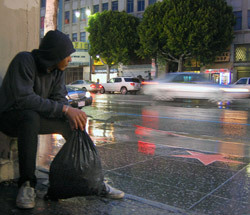 I thought that being a homeless teen meant that you were addicted to drugs, had abusive parents or were mentally ill. Even though some of those things were true for one of the teens I met, I was surprised to learn that their stories weren’t that simple. In this special package, funded by the South Coast Air Quality Management District, you can learn more about smog, and more importantly, some small steps you can take to help reduce pollution. Making friends was hard for Sophie, 15, because she was shy. After learning to play the piano, Victor, 17, filled his iPod with Bach and Beethoven. It took months to learn, but now Tyler, 15, loves riding the waves. We asked our teen staff how they show their school pride. Edgar, 17, no longer thinks that Latinos can't be as successful as others. Patricia's car has dents and breaks down, but it gets her where she wants to go. Jacky, 18, hopes police dogs keep weed out of her school. Sixteen-year-old Brian's asthma makes it hard to breathe on smoggy days. An air quality specialist says working to clean up the air is rewarding.